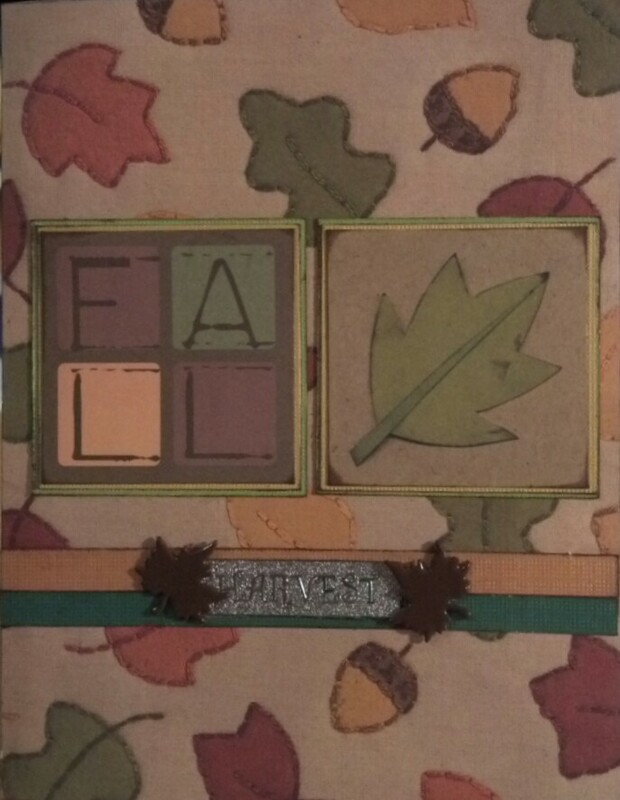 I am finished with the fall cards and I used almost all my fall Leaving Prints cutouts and made a pretty good dent into my leaf stickers. :) I feel it calls for a celebration! I am not sure what kind of celebration... but a celebration. :) I find the need to share these with you so I can have closure... ;) lol But it is the last I will share with you... until Christmas that is. 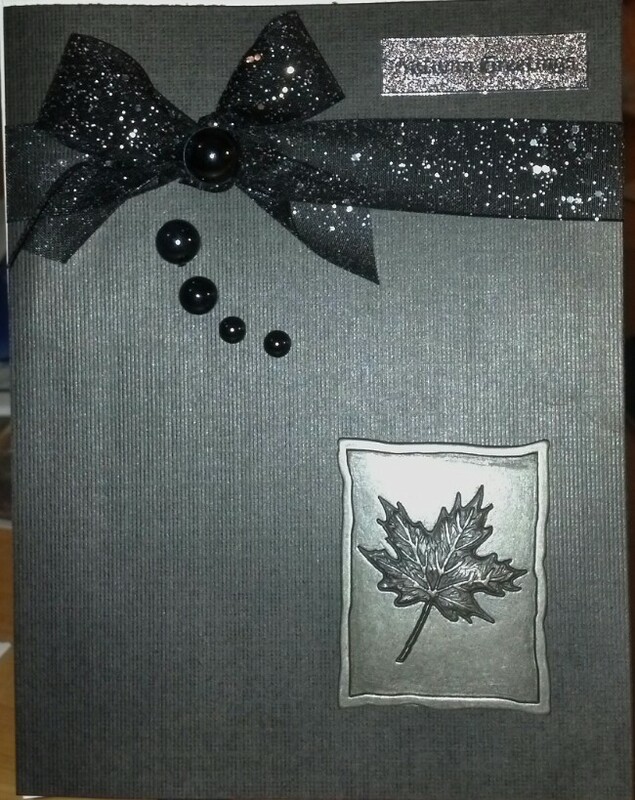 :) Unless I make a new card for a pen pal or a birthday card I feel I must share! I played with the idea of the first card and came up with this. I did the exact same thing! I forgot to place a ribbon down first, including the one on top and actually the one on top, was placed after I glued the mat on the base and realize some white card base was peeking through. I was NOT having it! 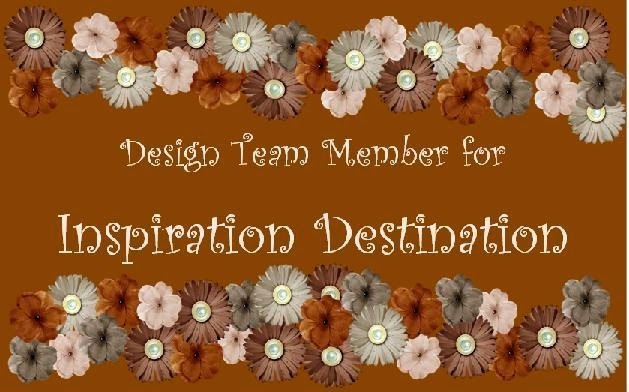 The ribbon is from my long hoarded stash but I know I originally purchased it at Michael's. 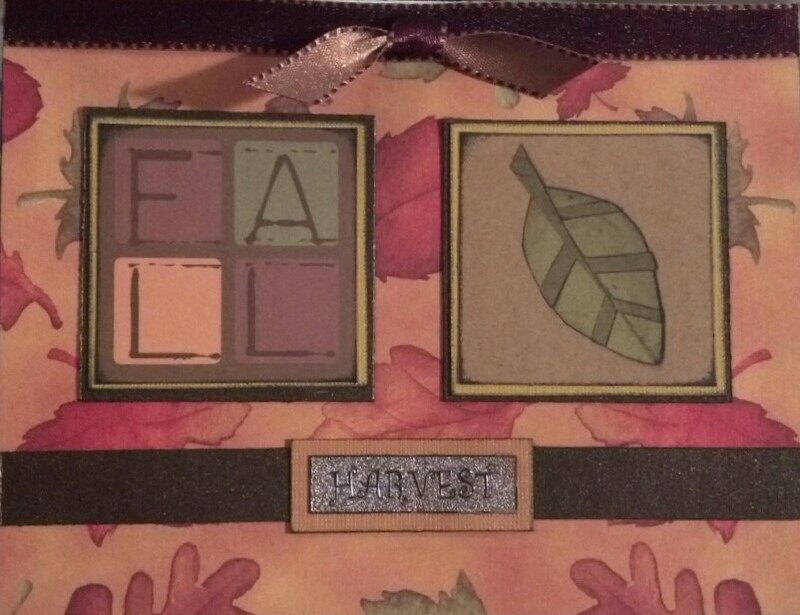 When I mounted the Harvest sticker on the gold colored mat, I knew it was not sticking right and I used an adhesive in order to stick it down. I continued with the idea of the black mat because I really like it! I used this metal leaf charm from Making Memories I found in my stash. The shiny beads are from Joann's dollar bin. This was the final cutout. No, that is not right. There are two left... leaves. 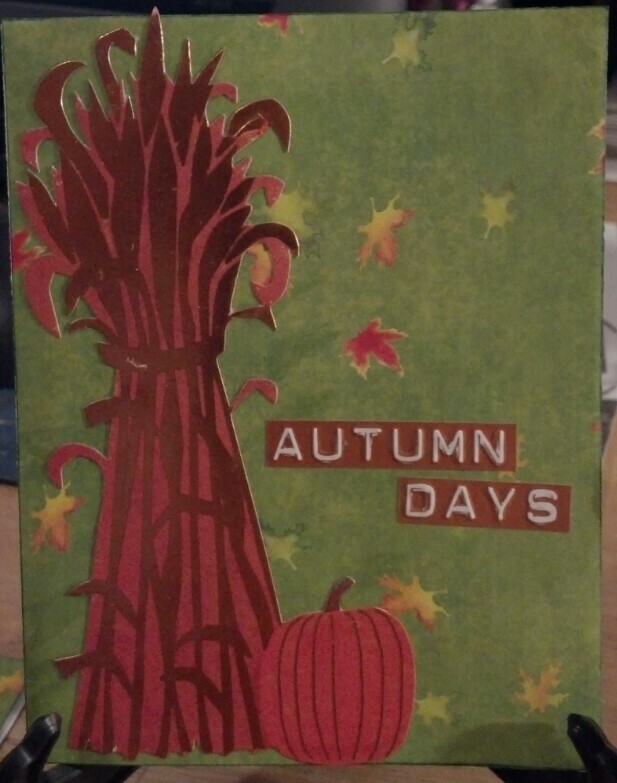 But it is the final cutout I am using this year... unless I discover I was wrong in my count and need more fall cards. 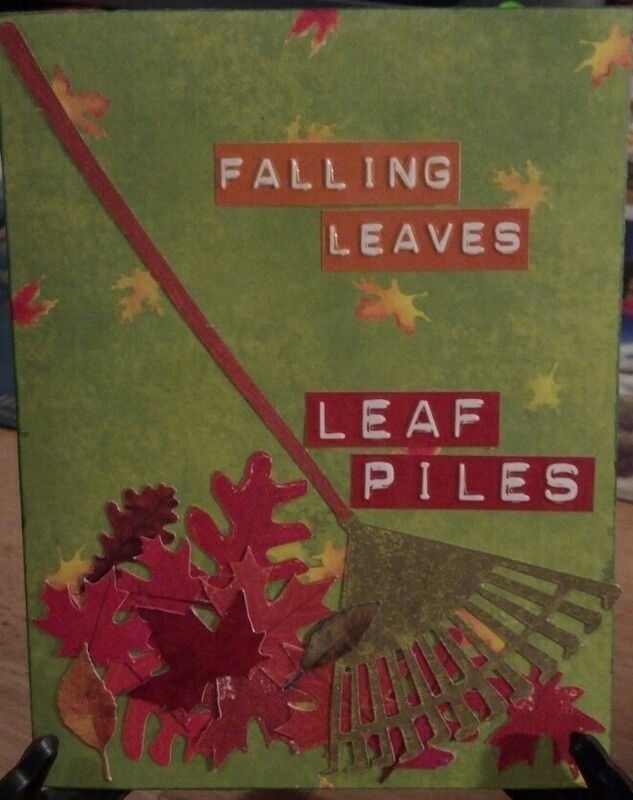 I found the plastic branch in my long hoarded stash and the card stock leaf stickers are from Miss Elizabeth's Dollar Tree collection. 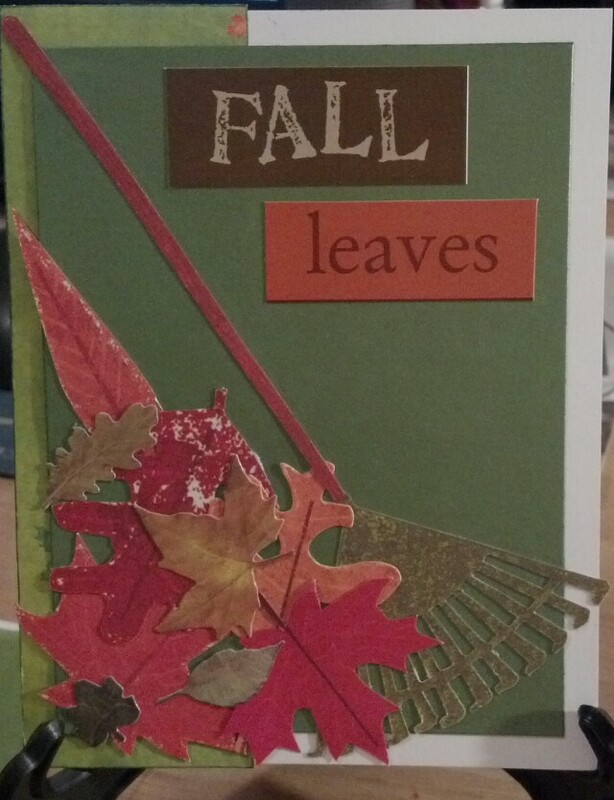 I continued with the same idea because I really liked the scattered leaves look! 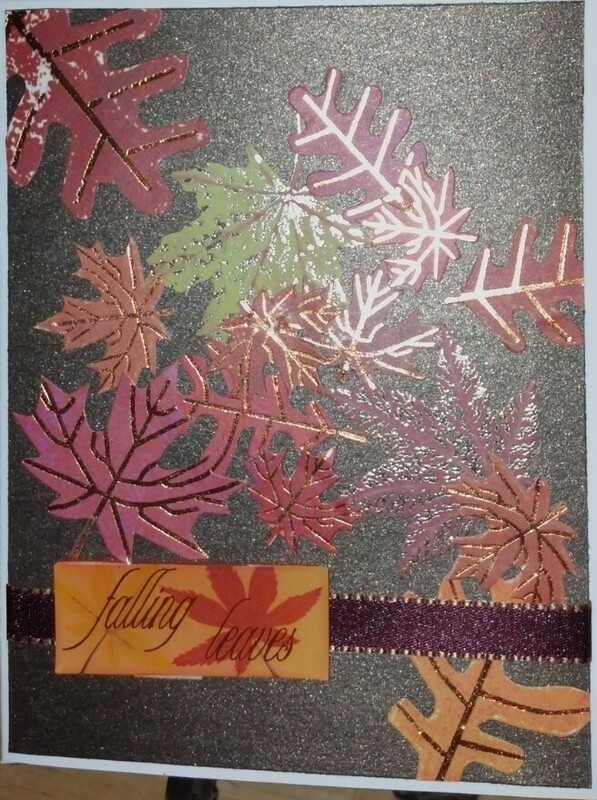 :) The leaves are vellum stickers from Jolee's and diecuts from a recently purchased packet that I removed from the packaging and for the life of me cannot remember who made it. :( Ugh! Short term memory loss! 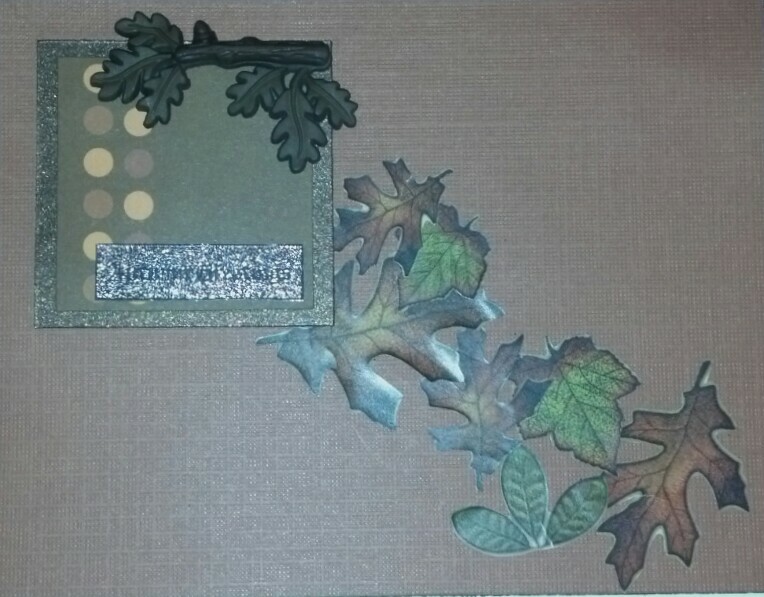 :-\ I used glue to attach the larger leaves to the background. 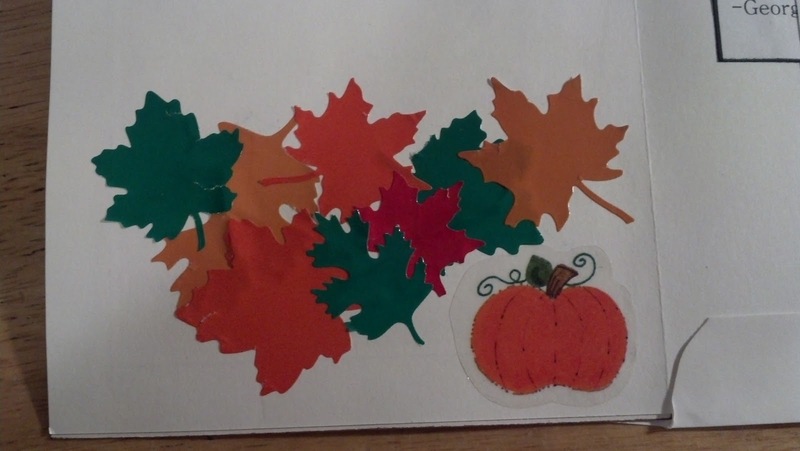 The three smallest leaves in the center are mounted with foam tape. The mat is a very deep purple. I think it kind of looks blueish here. 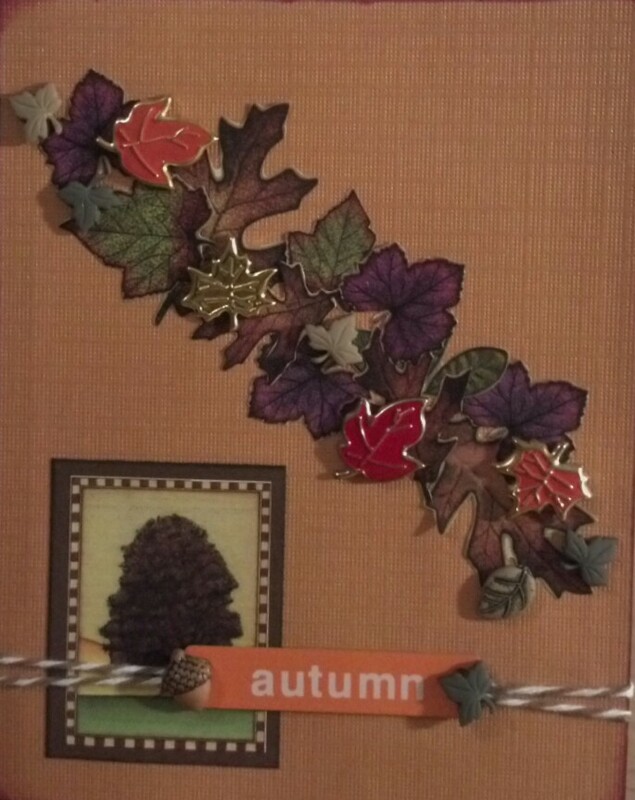 The pumpkin on the center of the flower and gold leaves are brads and I added these before I glued the mat to the card base. I remembered! 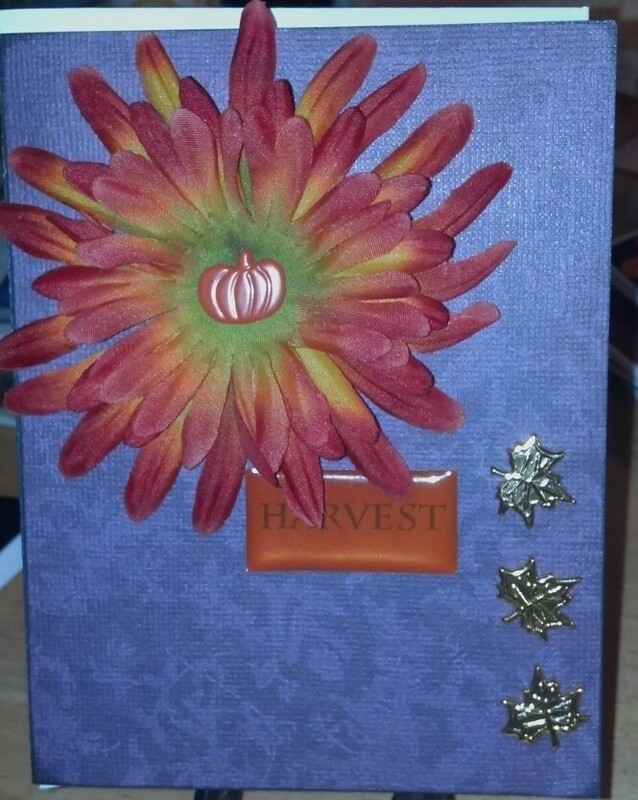 :) Flower petals and Harvest sticker are from my stash. As I neared the end, I took another count and realized I was short a card. I came up with this one quick! 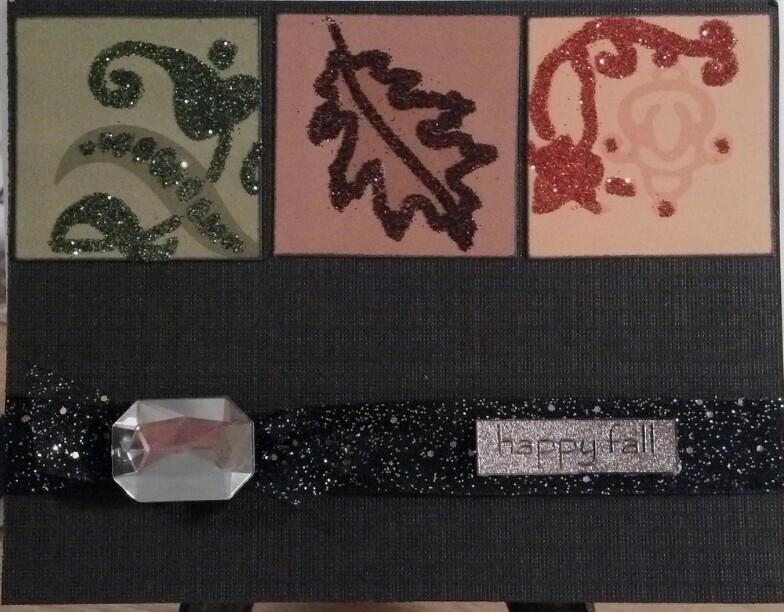 I'd seen something along this online on FB and Pinterest and this is my version. 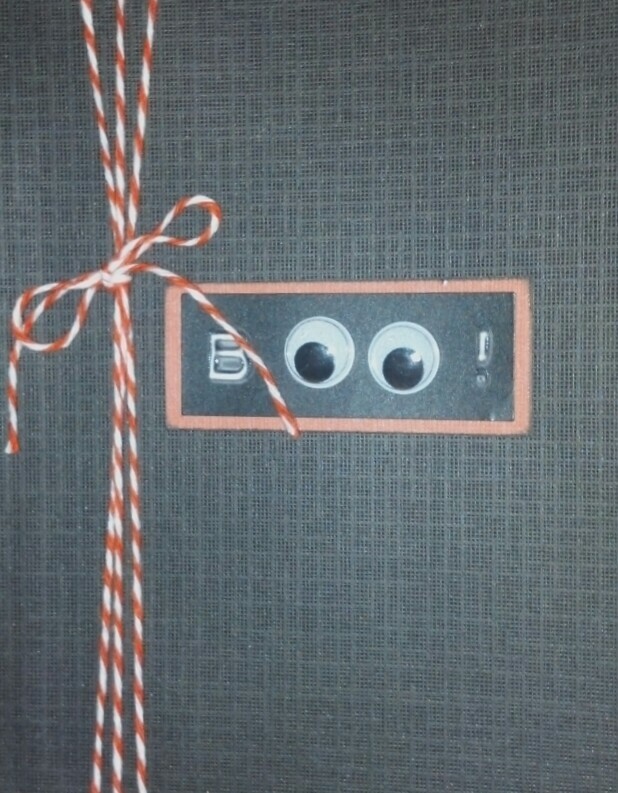 :) The twine is from Raisin Boat and the Boo sticker and floating eyes are from my stash.